Rumors have come down the pipe that Infinity Ward may be leaving the incredibly lucrative Call of Duty: Modern Warfare franchise behind for the time being. In case you somehow missed it, last year's Modern Warfare 2 was, um, quite successful in that it sold roughly 18.4 bazillion copies and had the biggest launch of any entertainment product in the whole of human history. Pretty impressive, huh? 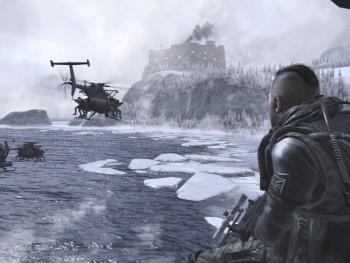 While developer Infinity Ward is currently working on MW2 map-pack DLC, people are naturally beginning to wonder what the studio's next surefire blockbuster will be - would they try to top themselves with a Modern Warfare 3? Apparently not, says a source to VG247. Infinity Ward is not making CoD Mewthree (which is good since that doesn't work nearly as well) but instead will be creating something "completely new." And by "creating something completely new," we probably mean the developers will be "spending time counting all of their money before throwing it into a giant bin to swim in a la Scrooge McDuck." Obviously, this is just a rumor and should be taken with a huge heaping helping of salt big enough to make Sony's new Sodium MMOG feel inadequate. But - if true - what would it mean for the Call of Duty franchise? It seems odd that Activision would let its golden goose fly off like that, though the publisher may be inclined to give IW the benefit of the doubt considering that the studio had to plead its case to be allowed to break free of World War II in the first place. Activision was recently rumored to have added a third studio to the Call of Duty franchise beyond IW and Treyarch, claimed by some sources to be the brand-new Sledgehammer, launched late last year by veterans from EA's Visceral team. In the light of this announcement, though, the addition of a third studio may not have been to increase production of the series, but to keep production to the one-a-year schedule as Infinity Ward goes off to do its own thing. In the absence of big brother Infinity Ward, it would also give Treyarch a chance to strut its stuff on its own - persistent rumor has it that the Santa Monica-based developer's next Call of Duty will be a heavily story-based Cold War-era game set in Vietnam a la movies like Platoon and Full Metal Jacket. But while we can talk about what this would mean for the CoD series all day, the real question is: What would Infinity Ward do next? Anything else would seem like a comedown from the gargantuan MW2 - how do you follow up an act like that?